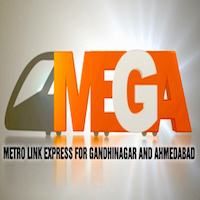 Online Application Details for Metro Link Express for Gandhinagar and Ahmedabad Company Limited MEGA-Gujarat Metro Rail Recruitment of 2 Assistant General Manager and 3 Senior Manager is given below. Application form and duly attested documents are to be sent to the application through email only at career2016@gujaratmetrorail.com along with the scanned copies of latest CV, payslip & testimonials. In envelope super scribed with 'Application for the Post of Post Name'.